WANAKA COTTAGE is a luxury Qualmark 5-STAR property, set in private, landscaped gardens with magnificent views of the South Islands snow-capped mountains. Our Cottage is perfect for smaller groups, and can sleep up to 4+baby. SPA POOL, a Super King oak sleigh bed,and a second bedroom with either a King bed or 2 large Single beds. Beds are made up on arrival with luxury linen, feather duvets in winter and cotton in summer. A gorgeous French Bathtub, a cosy open fire and lots of extra luxury touches. The Cottage also has SKY TV, ipod dock and free wireless broadband internet. Wanaka Cottages is situated on the edge of residential parkland just far enough outside the Wanaka township to be peaceful, but close enough to be practical with a two-minute drive to town. Florences cafe just a 2 minute stroll away. Spectacular Milford Sound is under an hour away by scenic flight, and Queenstown airport only a 40-minute drive. The ski resorts Treble Cone and Cardrona are just half an hour by car. 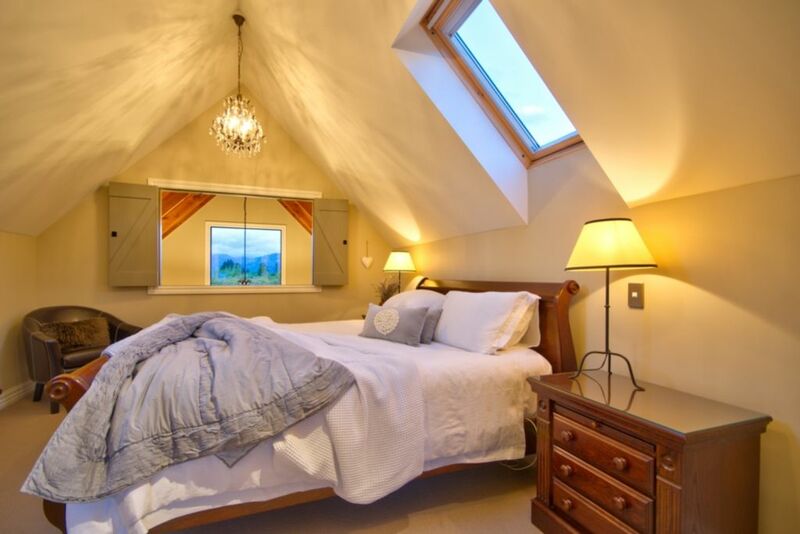 Wanaka Cottages - self-contained luxury accommodation for discerning couples, families and groups. Gorgeous places to stay for all seasons .... Love your holiday! We loved this little cottage. We are a family of 2 adults and 2 children, and it was perfect and just what we wanted for our stay in Wanaka. The views out to the mountains are stunning, especially from the master bedroom. The furnishings are really comfortable and the cottage had everything we needed, including the thoughtful welcome package provided by the owners. We loved the cafe right next door and were there every day for our morning coffee and croissants. There's great food options in town. It can often be a struggle to find good food when you're feeding 2 young kids, but we didn't have any issues in Wanaka. The supermarkets provided everything else we needed and the kitchen in the cottage was fully stocked with good quality pots and pans, a full pantry and a great gas stove for when we wanted to cook. The cottage is within close driving proximity to town, but far enough away to feel that you're away from it all. We definitely hope to stay again in the near future. Thanks for everything Ash and Jackie! They really were the perfect guests and tidied up so nicely you wouldn’t have known they were there- even with 2 kids under 5 ! Gorgeous property with a beautiful garden. It is quite a distance from town if you are walking, so best for those that are happy to drive into town or stay in during the evenings. Our baby loved the toys and we loved the hot tub! The muffins and bread etc on arrival was hugely appreciated too. A wonderful place to stay and we would highly recommend it. Beautiful guest home with lovely views. Clean and well appointed. Only concern was we paid extra to be in a quiet location. There were weddings w bands three of the five nights we were there. Host was apologizing and tried to keep them quiet after certain hours but was not what we had expected. Otherwise lovely location- especially if your going to the weddings! It is very rare that we receive noise complaints - which we did our utmost to deal with. This included speaking directly to the owner of the adjoining property ( who was unaware of the function taking place, which actually breaches his T&Cs); management at the wedding venue itself and of course, noise control. We funded breakfast for the four guests at a nearby café - as we totally understood their frustration, albeit the noise wasn't coming from our property. We hope the guests enjoyed the rest of their stay both in our cottage; Wanaka itself and our beautiful country. Beautiful private property, great location as your close to Wanaka village but out far enough to enjoy the quietness of the country. Waking up to the view of the mountains was gorgeous. Would highly recommend staying at Wanaka Cottage.